“Wall-E” or “Johnny 5”? | You Are NOT The Father! I won’t front, I really dig Pixar’s animated films. “Finding Nemo” in particular. I feel like that is their best movie. Only because it caught me out there. I was in the theater looking like a real sucker tearing up the same way people cry during the last 10 minutes of “Extreme Makeover: Home Edition”. Of course I like a lot of their other hits. So you know I’m there to see their new film “Wall-E” when it’s released next year. It looks like Pixar really stepped up their game, the animation looks really life like. 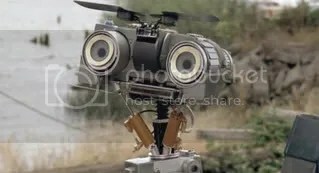 But come on, you can’t front on the fact that Wall-E looks like Johnny 5. And yep, they totally did make a video for El Debarge’s “Who’s Johnny?”. I am just as surprised as you are. I agree they totally ripped off jonny 5. Everyone should boycott this movie. In fact it would be great to see FOX sue Disney. The real title of the movie is Short Circuit IMDB it people and see it for yourself. At the time Short Circuit came out, people said Johnny 5 was a robot version of E.T. That said, everyone I know who has seen the Wall-e trailer says “they ripped off Johnny 5”. And a friend who disagrees with virtually everything I say said that all design follows a natural path and it was inevitable and by necessity that these robots look alike. I use the word “Front” because I feel like it. I don’t buy into the hype that slang words suddenly expire. Been using the word since Junior High in the 90’s. Thanks for reading my site though! The point is not that a certain robot morphology is bound to appear and reappear. Good ideas always do. The point is to acknowledge the heritage, identify oneself as part of the bauplan’s evolution not to claim one is an ‘adam’ . Also, this seems to me a blatant Walmart promotion. yeah, and the music is a rip-off of Terry Gilliam’s movie Brazil’s soundtrack. Shame on you Steve Jobbs for selling Pixar to Disney! The Return: “Dead Wrong” NYCHA Sketch of the Day! “John Rambo” Poster!